A teacher points to clearly-drawn Arabic characters on a blackboard and the third-grade girls at Aisha School gleefully make the corresponding sounds. A few minutes later the room grows quieter as the girls focus to simultaneously pronounce and write the letter corresponding to its sound. At a nearby school, first-grade boys stumble over themselves to get to the blackboard in time to point at the character that matches the sound their teacher just pronounced. The students in schools in the Amran govenorate, just outside Yemen’s capital city of Sana’a, are learning to read using a phonics method developed by the Yemeni Ministry of Education with USAID support. In less than one year, students, parents and teachers alike have embraced the Yemen Early Grade Reading Approach, or YEGRA. “It’s a miracle, the teaching of reading is suddently demystified,” said the principal of a school. YEGRA focuses on intensive teacher training in a method that teaches first- through third-graders to read using phonics. Each lesson is 70 minutes long, and follows a set procedure, which includes reviewing a familiar story, reading stories aloud, focusing on the sounds that make up words, and writing. The program has also produced brand-new grade-appropriate teaching materials, including readers that children can take home to practice with their parents, and handbooks that help both literate and illiterate parents to support their children’s learning. Until last year, Yemeni children were taught to read using word recognition and corresponding pictures, but the technique was clearly not effective; when USAID tested young students in 2011, it found that fewer than one-third of third-graders were able to read. After just eight weeks of the YEGRA method, which has been implemented in 380 of Yemen’s schools, first graders could decipher 10 words per minute – the goal in first grade is to identify 30 words per minute. And, an informal analysis in the governorate of Taizz found that first-grade students could read just six words per minute prior to YEGRA, but after nearly three months of YEGRA lessons, 97 percent of the first-grade students were able to read 20 words a minute. Ministry of Education and USAID teams visited three Amran schools in March and saw YEGRA’s dynamism firsthand – students were eagerly answering questions and following along in the lessons. They also attended a teacher training, where teachers for grades one through three throughout the region learned interactive teaching techniques and methods for futher engaging students in reading. By next school year, at least an additional 3,000 to 5,000 teachers will be using the YEGRA method. 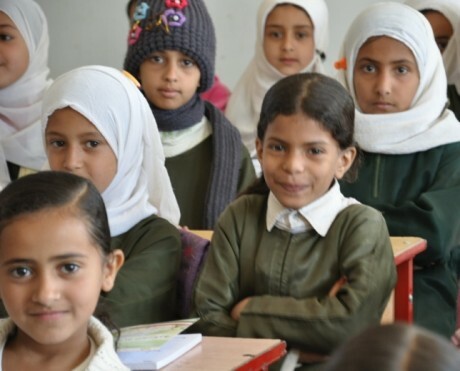 USAID, in partnership with Yemen’s Ministry of Education and local governments, is also making education more accessible to Yemeni children, and especially girls, by rehabilitating schools to improve sanitary conditions and make it safer to go to school. USAID has rehabiliated more than 200 schools throughout the country since November 2011, with a particular focus on those in conflict-affected areas. An estimated 280,000 students were unable to go to school during the recent conflict in the southern governorate of Abyan and its aftermath. Together with the Ministry of Education and the Governor of Abyan, USAID completed a major rehabilitation of 10 schools in Abyan, and will rehabilitate and furnish a total of eighteen over the coming months. Next school year, students in Abyan will not only be back in school but they will for the first time learn how to read and write at grade level with YEGRA. One-third of out-of-school girls in the entire Middle East and North Africa region reside in Yemen and only 53 percent of girls who begin primary school complete basic schooling. Our early education programs in Yemen target both boys and girls, and the Ministry of Education is convinced that these educational improvements will not only ensure that students can read with comprehension and go on to learn other subjects, but will also increase enrollment and lower dropout rates, especially for girls. After the success of the first year of YEGRA, the Ministry has initiated reforms to its educational curriculum and is committed to taking the program nationwide with the continued support of USAID and other donors. As this generation of boys and girls learns to read and goes on to master other subjects, the increase in girls’ enrollment should continue to grow. Better access to schools and higher literacy rates will provide greater opportunities for Yemen’s girls. Read more about our work to improve girls’ enrollment and educational opportunities in Yemen. i noticed the activities of this project from the media channels, it looks like new media campaign to encourage the early reading. its good start from US to help in this issue, we really appreciate this and will reflect the real image about USA, thank you.